This attractive Czech 3/4 bass for sale was hand-carved in 2007 by the small (Rudolf) Rudolph Fiedler workshop. The bass has not been previously owned and has no signs of wear; there are no faults with this bass. The carving is excellent and the yellow-brown varnish is lovely. It's dimensions are a little larger than many 3/4 basses, which helps give it its deep and rich sound. This 3/4 Rudolph Fiedler Bass plays as well as many basses priced in the 20K's and is a very good deal. 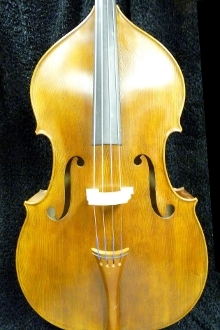 For $9900.00, this Fiedler would make an excellent bass for an advanced college/ professional player who is looking for a good sound at a good price.